Become One Of Less Than 1% Successful Startups! - DE Inc. Become One Of Less Than 1% Successful Startups! Home/Become One Of Less Than 1% Successful Startups! Congratulations on your decision to take responsibility for your own destiny by becoming a small business owner. It puts you into a very elite group within the population. How do you become .08% that can fetch more than $1,000,000 purchase price in the end? Avoid making the mistakes 95% of all business owners make! DE, Inc. can help you add the few missing steps most business owners make so you can create a successful business in 3 -5 years. “The business planning tools and strategy documents DE, Inc. provided us to use for our new business have accelerated our productivity and time to market by cutting out the “noise” and offering clear direction. I highly recommend using these proven solutions to any business.” – Brantley Smith, CEO, Leads Direct, LLC. Don’t mistake personal success with business success! If the answer, is NO, or “it would take me a couple of years to get things in order,” there is your proof! You probably think this person is pretty successful. And you’re right they are successful. But, their business has not advanced to the level of the less than 1%! Don’t fall into the trap yourself and miss the rewards of real business success! You are just getting started. Do the right things now and you can avoid the pain and frustration later being experienced by the other 95%! Be among the less than 1% of successful entrepreneurs! Just complete the form below to finding out what the 95% are missing by get our FREE e-book Your First Steps to Real Business Success. 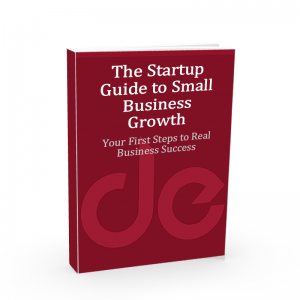 Have more questions about what it takes to create a successful startup business? Contact DE, Inc. at 727-487-5435 or info@www.dinoeliadis.com.